The poet Lord George Byron was a rake and a hellraiser who also happened to enjoy his own company and the solace of silence. Apparently he wrote much of his poetry – in his head – while stomping around the English countryside with only his massive Newfoundland dog, Boatswain, for company. Then when he got back to his ancestral pile, he would write it all down in longhand, exactly as it was. His comment struck me as humorous – because his household is the noisiest in our street – but he wasn’t being ironic. In my apartment block, the residents are forever complaining about how his three young children are driving them nuts with their screeching, yelling and crying. During summer, the residents living either side of me become understandably distressed about the commotion that goes on all day and into the night. They hang out their open windows and vent freely about the noise, the smoky barbeque, the kids screeching and the adults all recreating at full volume. Obviously my fellow apartment dwellers believe that they can be heard above the pandemonium going on next door. And I often wonder – do parents with noisy offspring inevitably have to master the art of simply not hearing them? This is usually around the time that I put on my industrial strength builder’s ear muffs. No kidding, they’re great. And now that I’ve graduated to noise cancelling ear phones I’ll be able to listen to soothing music, instead of the clamour of everyone going insane in the summer heat. However, next door’s ruckus is nothing compared to another inner-city apartment I lived in, where I had a neighbour I called the Midnight Rambler. He had the tasty habit of firing up his chain saw in the midnight hours. And for some reason he waited until night time, before going about home renovations such as the tearing up of his floorboards. One fine day the Midnight Rambler set fire to a big pile of rubber tyres in his backyard and smoked us all out. I was hosting an outdoor luncheon at the time and the billowing black smoke was acrid and ominous. Everyone was terribly pleased when two fire trucks arrived with sirens blaring. My guests immediately rushed upstairs and leaned out the windows overlooking the street, waving their champagne glasses and cheering on our splendid firemen. Noise is strange thing. Often how intensely you hear noise depends a lot on mood and location. In pubs when the cheery clientele are more than half-cut, mind blowing noise is easily tolerated. Yet the same number of decibels elsewhere will cause a near riot. And as high-density city living is increasing, it’s not a problem that can easily be solved. 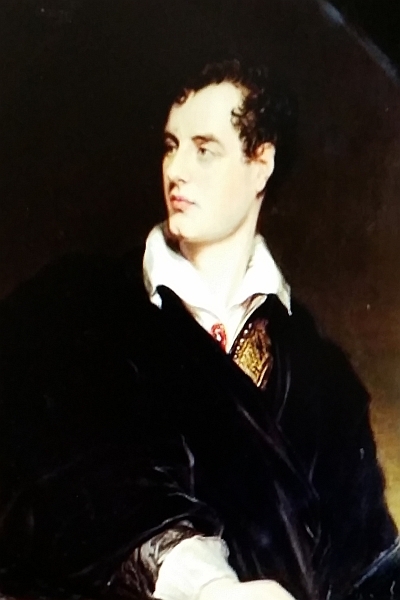 Photograph: ‘Lord Byron’ by William Essex 1844, after a painting by Thomas Phillips 1814.